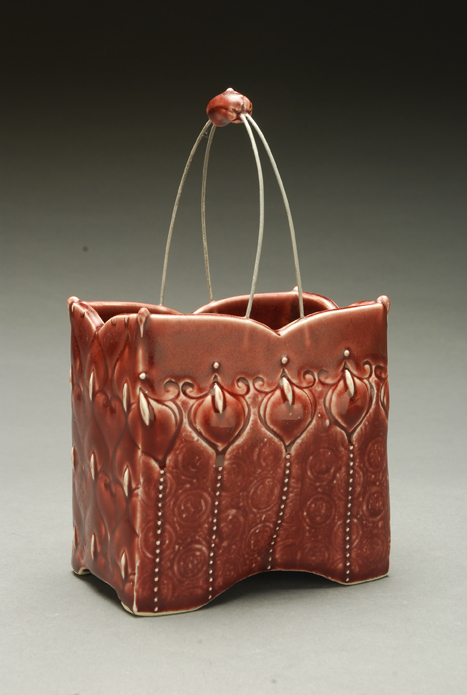 This is a lil’ Wire Basket (7″h x 4″w x 3″d) I made over three years ago. I enjoyed making it, and have continued to like it, but just this week decided to make more. My ideas are frequently ahead of my fingers. I have described my process —including idea- development— as being glacial at times. (This piece seems to exemplify the point.) My sketchbooks contain more ideas than I will probably ever make. I’m not quite sure what makes the time seem right to pursue certain ideas, but this one’s has arrived! I have used Kanthal wire on certain forms for years as a way to “draw” in space with another material. (Check out the Wire Flowerbrick on my Gallery page, and a brief explanation of Kanthal wire on my Process page.) More to come! I’m always amazed that the clay doesn’t crack when fired with wire in it.Does the wire have the same amount of thermal expansion? Also I noticed that the area where the wire is inserted in your piece causes the glaze to be lighter. What causes that? Just being my usual curious self. Hi Kristen, what a great basket, will be checking your other pages on Kanthal wire. Drawing in space – I like that description. I will have to give that some thought. My sketch book is overfull, I don’t think I will ever get to all that’s in there and yet I continue to add more to it. At times I flip through it and a piece somethow tells me it wants to be made. Thanks. Hello Kristen, what gauge or size Kanthal wire do you suggest a beginner to use? As I have told you many times, your work is absolutely terrific and I am looking forward to purchasing your DVD. Thanks so much for sharing so much and inspiring beginners like me.